Mac & Cheeza’s macaroni and cheese underwhelmed us, and Clifton’s mac and cheese mildly repulsed us. We shrugged at each other and thought, how much worse could our luck get? As it turns out: much, much worse. As we left Clifton’s Brookdale, Hilary tried to show Suzy the door to the hidden bar she’d once visited. 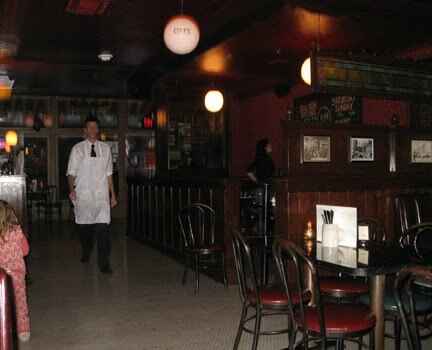 While looking around for it, Hilary suddenly realized said bar isn’t at Clifton’s – it’s at Cole’s. And Cole’s is just a few blocks from Clifton’s, and we really, really needed a good macaroni and cheese at that point, or at least a stiff drink. We achieved exactly half our goals. 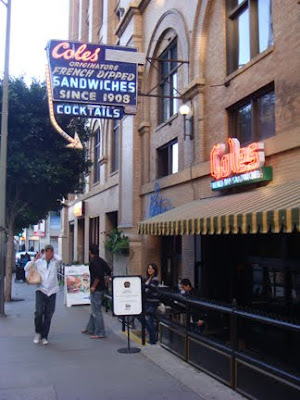 Cole’s, Originator of the French Dip, is a charming saloon tucked into the building that used to serve as the hub of the Pacific Electric railway system, back in the day. We loved the décor, everything from the suspended light fixtures to the red flocked wallpaper. We loved the menu, because what’s not to love about a menu that offers more cocktails than food items? But! Did we love the macaroni and cheese?? No. We did not love the macaroni and cheese. We did not even remotely like it. In fact, one of us actually spat it into her napkin rather than swallow the offending morsel. 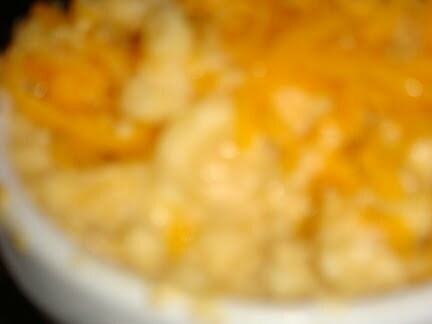 Even our camera didn't like Cole's macaroni and cheese. Sad trombones!! Now, Cole’s (OotFD) was our third mac stop of the evening and it’s true that we were feeling more than a little demoralized. How could all those positive Yelp reviews be so misguided? How could our luck be so bad?? More to the point: Have we become so mac-and-cheesiously jaded that only the best of the best will earn even our faintest praise? We don’t think that’s the case. One thing we adore about macaroni and cheese is its wild diversity of manifestations. We’ve been intensively reviewing restaurant macs and homemade macs for almost a year now, and we’ve yet to encounter a new mac that is the same as an old one. We appreciate the comfort of a down-home, roadhouse mac in a styrofoam box just as enthusiastically as we celebrate the beauty of a high-end preparation served on fine china. And especially on the night in question, we were prepared to gush cheesy, gooey praise all over any half-decent mac we could find, if we could even find one, to take the sting off a lousy downtown dining experience. That’s when we noticed the odd aroma emanating from our fully laden forks. An excess of onion powder? We weren’t sure, but it was a funky odor that did not bode well. As unhappy as our eyes and noses were, our poor mouths took the most punishment. That mac was gross. No two ways about it. Again with the fluffiness, only worse! In the algebra of our story so far, Clifton’s mac is to pie meringue as Cole’s mac is to shaving cream. 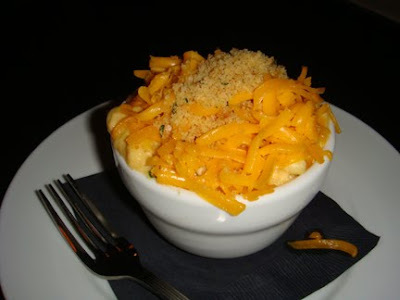 Cole’s mac is one of very, very few restaurant dishes we’ve ever sent back to the kitchen. Our waitress graciously took it off our bill while we drowned our sorrows in a basket of decent fries and a couple classic cocktails. Caution: This drink was so strong, even its mere photograph can make one tipsy. 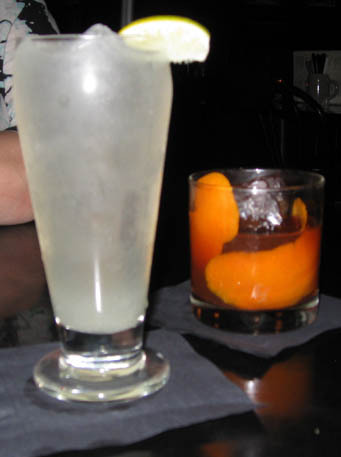 We loved the way the broad swath of fragrant orange peel hugged the walls of the glass, and how the wicked liquor embraced the giant, custom-hewn ice cube. 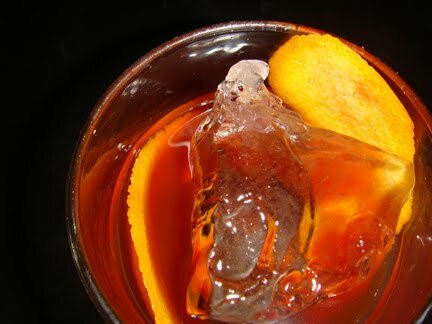 (Suzy’s first fancy-pants hipster ice cube! Woo!) We’re not physicists but the ratio of the ice chunk’s surface area to its volume, or something, kept the cocktail perfectly chilled without watering it down. It was a thing of beauty, and it single-handedly saved our evening from total disaster. This town is getting us down. It’s back to the kitchen for us!